The "Take It! " came after a quick glance out the window that I was sitting next to. I have to confess to having become a bit jaded about air travel as I used to do a lot of it. For the most part I get on a plane and go to sleep almost immediately. Well, things have changed. I have become a promotor of the web site, and speak to all that I can about the fun we are having in putting all this together and the comments that are being offered as a result. So, it was a break in one of these conversations that I looked out the window and saw the wing doing its thing and the stabilizer being of help. It took four shots to center and capture everything, complete with a sun glint on the top of the stabilizer. 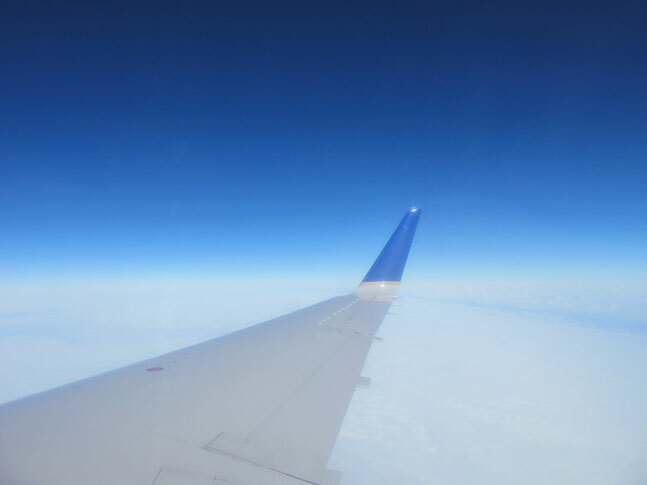 The wing was painted white over the white cloud cover, and the stabilizers dark blue to match the overhead dark blue sky. The horizon somehow lined up just right that makes this one, easy on the eyes. The "Just doin my job" came from watching the wing be that much more effective by having the stabilizer as a part of it. The life comparisons are many as stabilizers come in many forms. We all know many of them, the challenge is to take them on for ourselves and help us as we are on our journey. Yes, even to help us "fly right." The After Take: This picture seems to bring about a happy reaction each time I share it. Its simplicity matched up with vivid color seem to captivate and relax all at the same time. The taking of this picture was a shared event. I had the feeling that I was being helped to line up the progression of shots to get it centered and ready to show. Thanks for your help. Fuuny how the wing blends with the sky. His job being to bring us these interesting and beautiful pictures on a weekly basis, i assume.